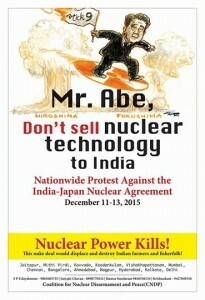 We call for a solidarity action on Thursday, December 10th, at 1 pm in front of Areva, 1 Pl. Jean Millier (take Metro No 1 to La Defense and go to the entrance of the black Areva Tower). 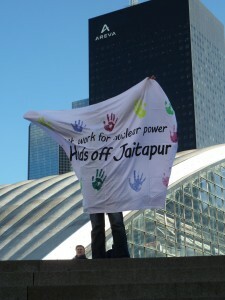 “Don’t work for nuclear power – Hands off Jaitapur” at headquarters of Areva in Paris. After reading out a letter from Jaitapur to nuclear workers in Europe we will walk to nearby EDF to read out the letter there again. Then we will have small discussion groups in front of EDF. . Areva/EDF want to build the world’s largest nuclear power plant in Jaitapur. In case police will arrest us, we will be proud to be European part of Jail Bharo Andolan which is planned for December 12th in Jaitapur. 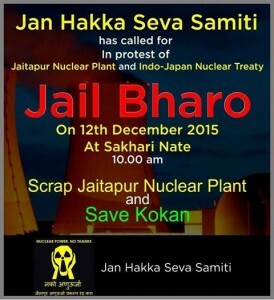 With their voluntary arrest action Jaitapur people protest against nuclear agreement between India and Japan.